If your property is built on piled foundations, any additions will require piling to ensure the new construction is built on a like for like basis. If there are any underground services within the footprint of your proposed build i.e. water mains, main drains or culverts, then piling will be required to avoid damage occurring. If tree roots have been identified as a potential risk that could affect traditional footings, piling is a failsafe solution. If access is restricted for traditional footings i.e. 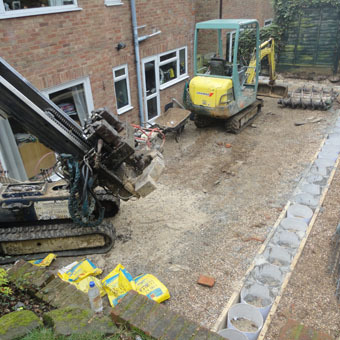 if existing neighbouring buildings are within one meter these could be at risk whilst excavating deep strip footings, piling is considered a much safer option. Piling is the best way to eliminate any risk of subsidence / ground heave in certain conditions. For more advice and a no obligation quotation, call today.